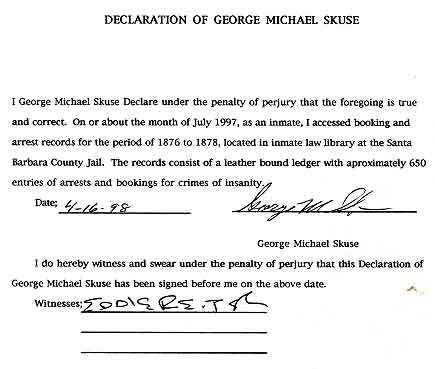 The Declaration of George Michael Skuse. The language of the Declaration is defective. This was before I had developed any legal expertise. The declaration is signed by a witness. 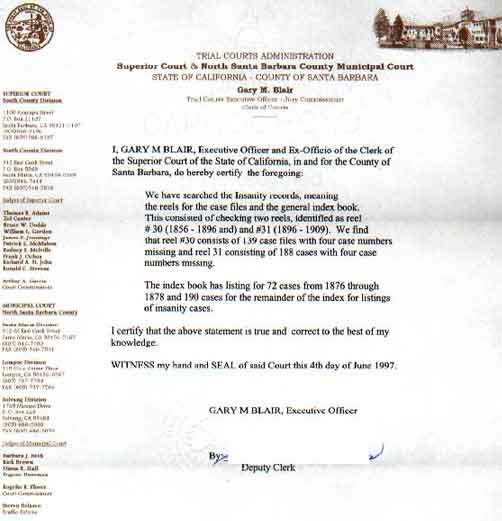 This Declaration was presented to the mental health technician at Santa Barbara County mental health Department on the day the technician wrote the note saying Santa Barbara County does not have the resources to inspect its arrest and booking records. Twice as many arrests for crimes of insanity in two years as insanity actions for 53 years. Each arrest for a crime of insanity must have an insanity action. How can there be 650 arrests for crimes of insanity for 2 years and only 327 insanity actions for 53 years of court activity? The two documents prove there are at least 300+ missing insanity actions from the public record.